I have been through San Jose a few times before but every time I end up drinking beers from breweries outside the area. 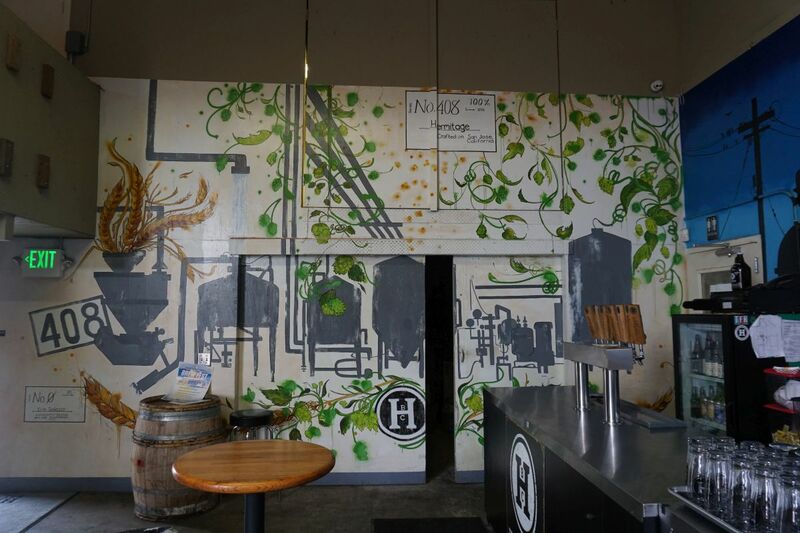 I go for breweries that are worth taking a separate trip to visit. On my most recent trip, I had planned to visit Lazy Duck as a stop on the way to the airport but due to some changes, I ended up visiting both Hermitage and Lazy Duck in the same day. 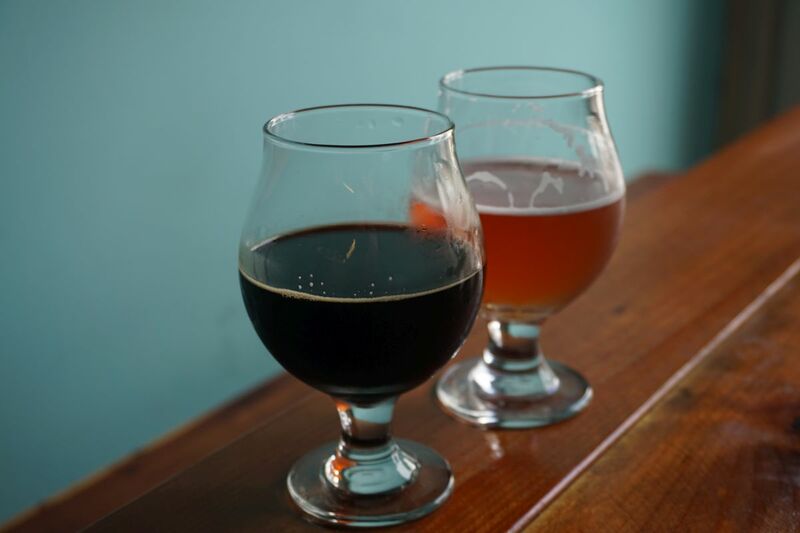 Both breweries are considered by the locals I have spoken with to be the best in the area. I started at Hermitage mostly because it was further South and I had lunch South of San Jose that day. I was the first visitor of the day, which is not surprising for a Sunday especially on a chilly day where rain was forecast. The place filled up over time as people came by to drink and fill growlers. The tasting room space is fairly standard open warehouse style. They had a wide variety of beer styles but I had heard of them mostly for their sours, so I tried two of those before moving on to the next spot. The Cherry Rocinante was an excellent delicious Flanders style red with cherry. 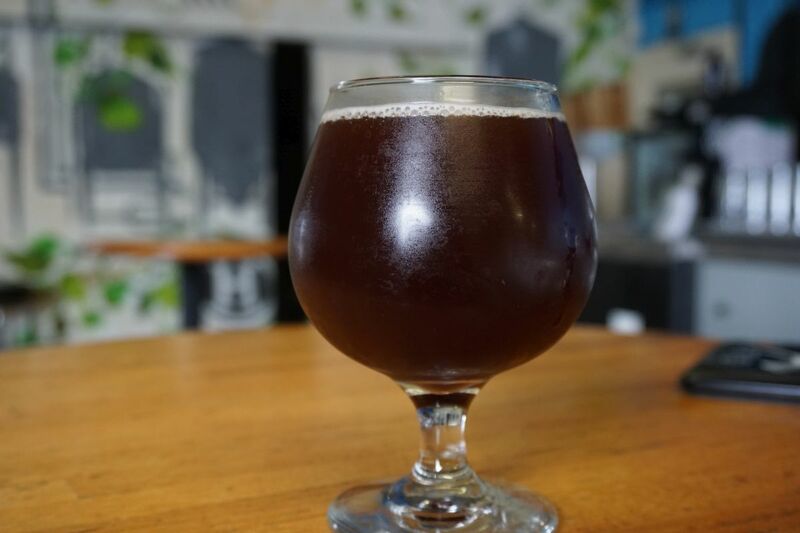 This is a traditional Belgian style sour red ale that is common to see at breweries. This version was a cloudy dark reddish brown with prominent cherry and a dry tart finish. The beer had mild notes of vinegar and hints of caramel. Many of the other sours served at Hermitage were high alcohol, over 9%. I decided to stick to a 5oz pour of Eurynome, sour stout, which clocked in at over 11% alcohol. Euronome was a delicious dark sour with tons of dark chocolate, notes of dried cherries and currants and a mildly tart finish. I would not have guessed from drinking this beer that it was so strong. It hides the alcohol quite well. Based on my short visit to Hermitage, I expect I will return when I am next in the area. The two sours I had suggest to me that they know how to make a quality barrel aged sour. 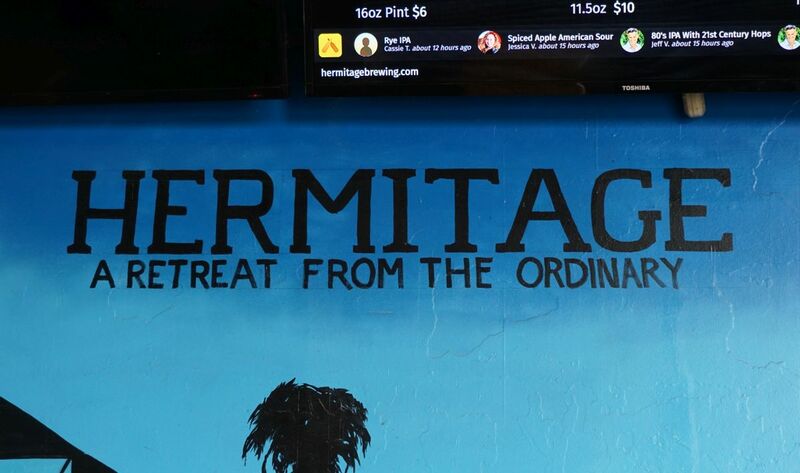 Though Hermitage had a variety of beers, they are best known for their barrel aged sours. I didn’t try their other styles. 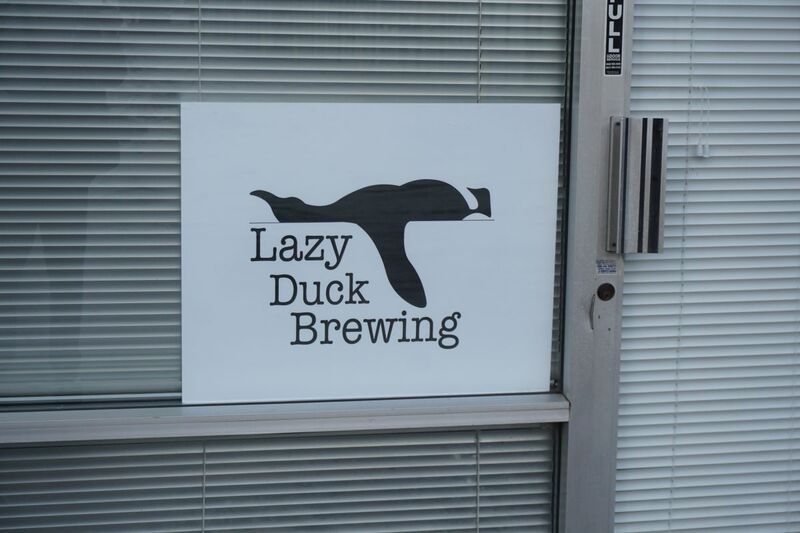 When I walked into Lazy Duck, I was surprised by the appearance of the brewery. It was by far one of the roughest looking tasting rooms I have visited including back when Alesmith hadn’t put much money into their old tasting room some 7 or 8 years ago, and even more so than my first visit to Lightning before they had a tasting room. Lazy Duck had sheets and cardboard paneling blocking off the tasting room from the brewing area. Also, when we approached the brewery, my husband pointed out that the area we had entered did not appear as if it was very well maintained. Despite all that, I followed the advice of my fellow beer enthusiasts and ordered some of their beer. 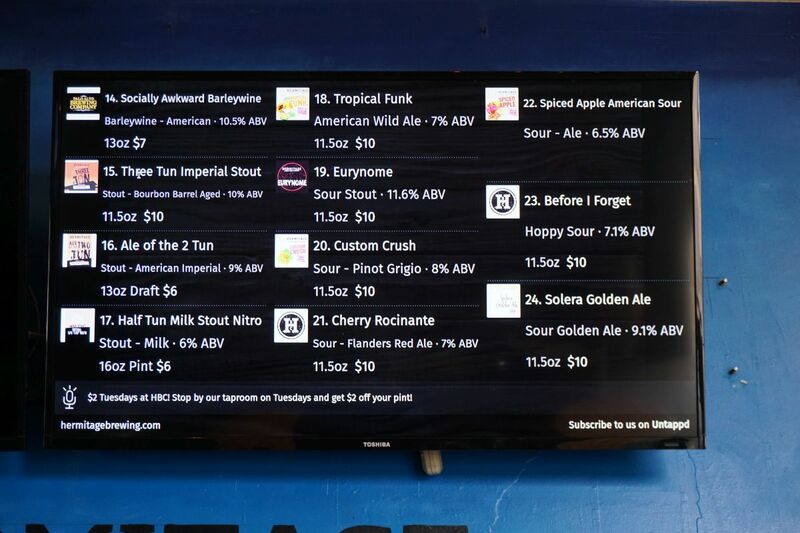 The first question I asked the beer tender was whether any of the sours were barrel aged. I was told that they are not barrel aged but are also not kettle sours. They are quick fermented in the stainless steel tanks. After having visited Hermitage and reading that the sours here were the best in town, I had to give them a taste. I started with the strawberry sour, which to me didn’t taste much like strawberry. It was nicely balanced with prominent acidic tart and a soft carbonation. If this was the only sour I had of the day, I would have left disappointed. On the recommendation of someone sitting at my table, I tried the raspberry sour next. This was much closer to what I would have expected, with tons of acidic raspberry flavor and a nice underlying funk. I can see why this beer would get people to come visit such a small tasting room. My husband had the imperial stout with maple and coffee. 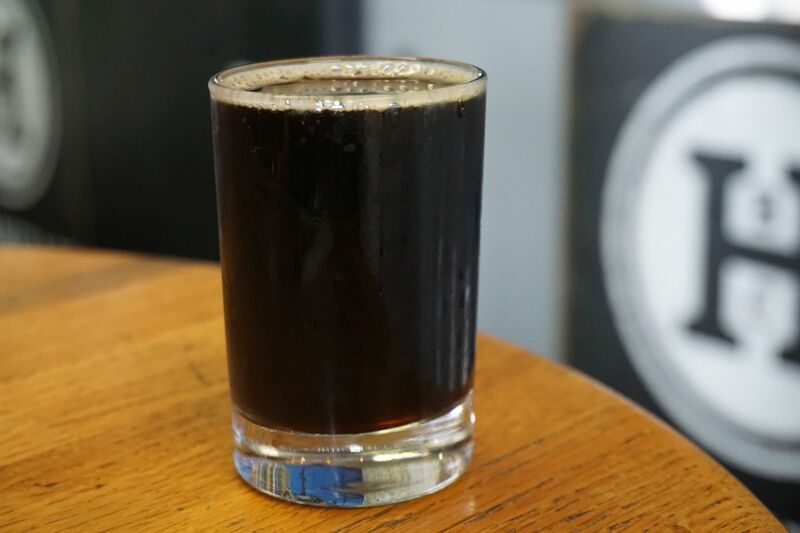 He initially noted how it seemed quite boozy, reminding him of a barrel aged stout. 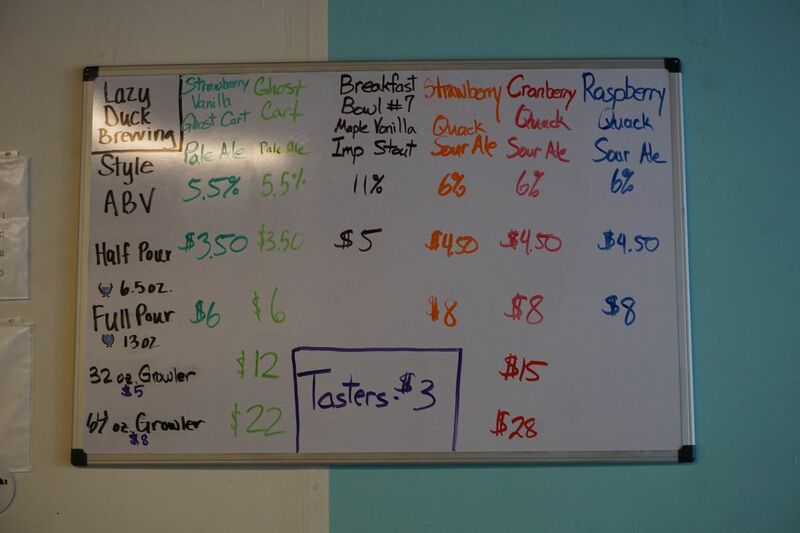 After some of the Strawberry sour, I gave the stout a taste and found it to be below average. The beer had prominent notes of dark cherry and overall tasted more like Dr. Pepper with a hint of licorice at the finish. I wouldn’t have expected the sour cherry flavor or licorice flavor in a maple coffee stout. I suspect some of their sour yeast got into the stout and it got sour over time. While Lazy Duck made some decent sours, I personally would sooner return to Hermitage. 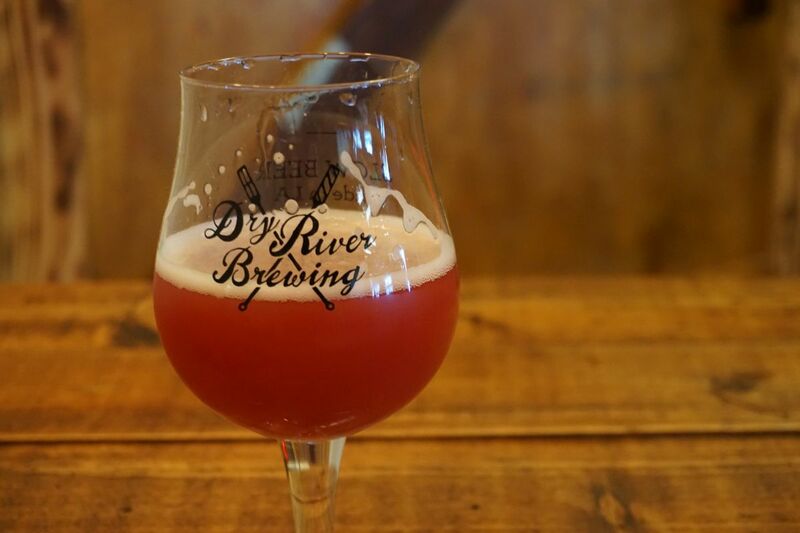 Known for: Come if you like quick sours with lots of fruit flavor. None so far are barrel aged. 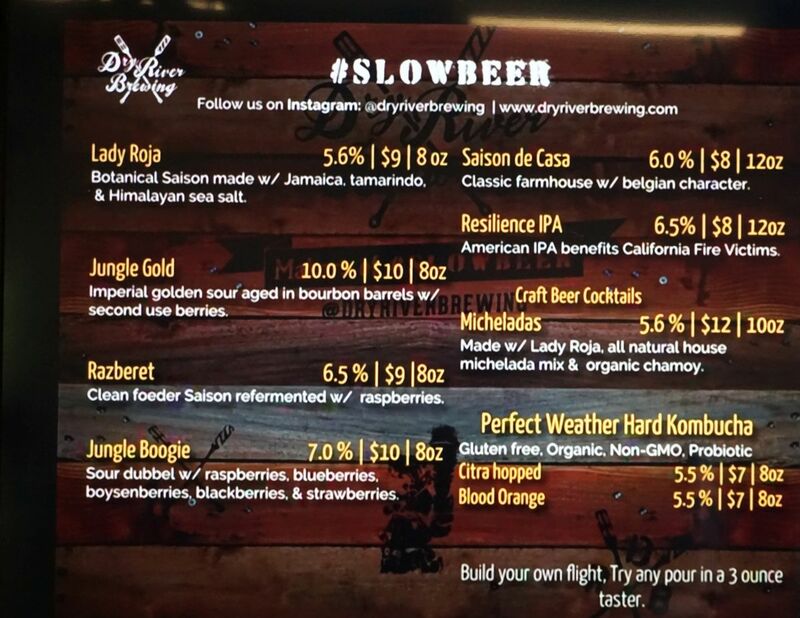 Dry River Brewing is located in Downtown LA not far from Mumford and a few other downtown breweries. Though getting to it from the freeway requires a bit of maneuvering. 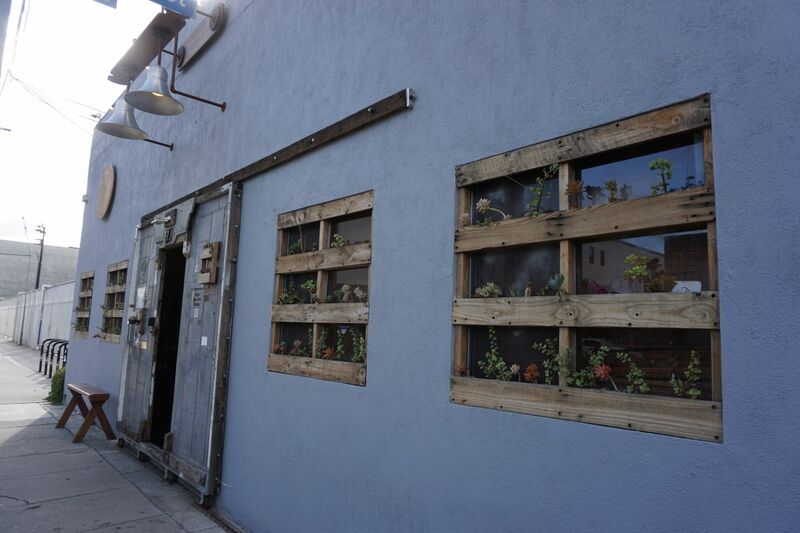 They have a small tasting room surrounded by abandoned warehouses. 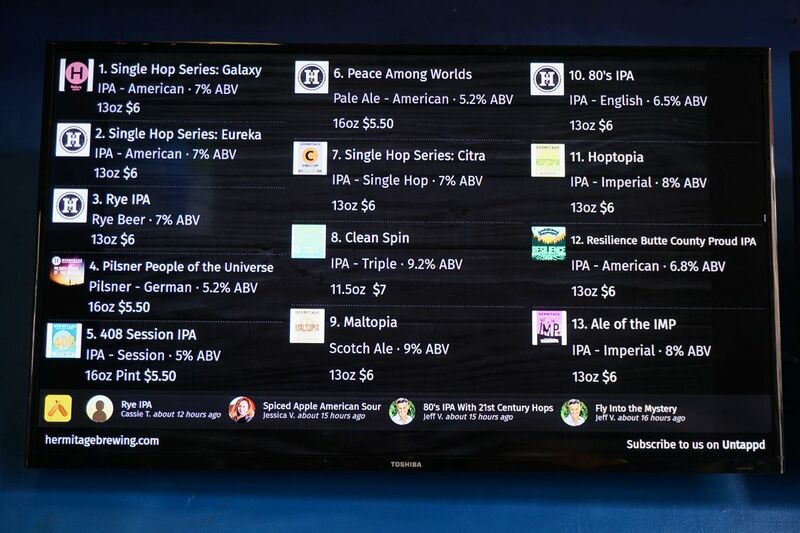 They focus on sour and Belgian style beers so those beers are fairly standard prices even at $10 an 8 ounce pour. I ordered two different beers there on my way South. 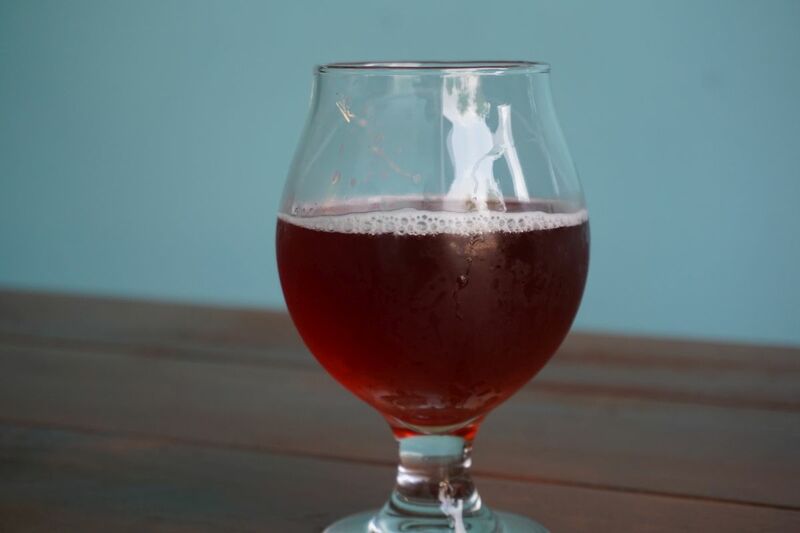 I started with Razberet, an oak aged saison aged with raspberries. It had a white cake base with prominent sweet raspberry and just a hint of tartness. I finished with Jungle Boogie, described as a sour dubbel with five types of berries. I wouldn’t have guessed this was a dubbel base if they hadn’t said anything. It tasted like an excellent wild ale aged on berries though. The beer had a ton of funky tart character and intense tart berry notes on a nice soft body. 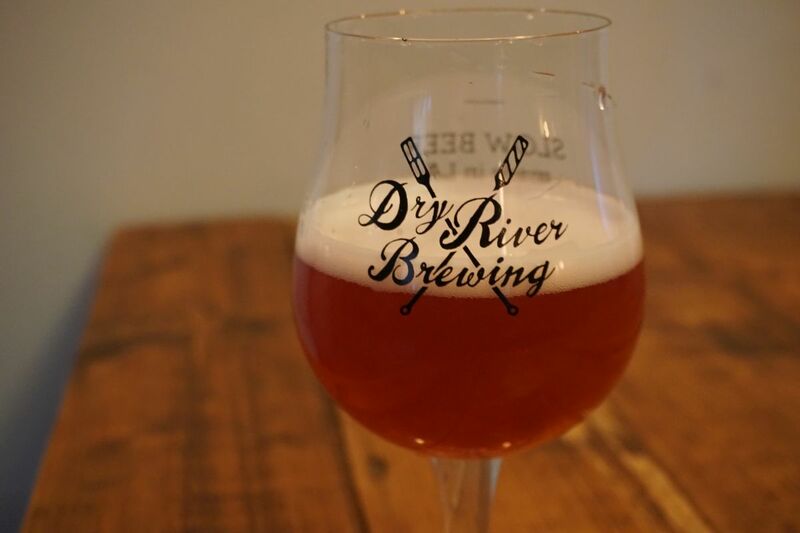 If you are a fan of sours, it is worth giving Dry River a visit. I did not taste everything they had but the Jungle Boogie suggests that they know how to make a sour and are a spot to watch. They also brew the occasional IPA but they didn’t say what their house approach is to the style. Shortly after my visit they started canning certain beers and now have the occasional beer to-go in cans.